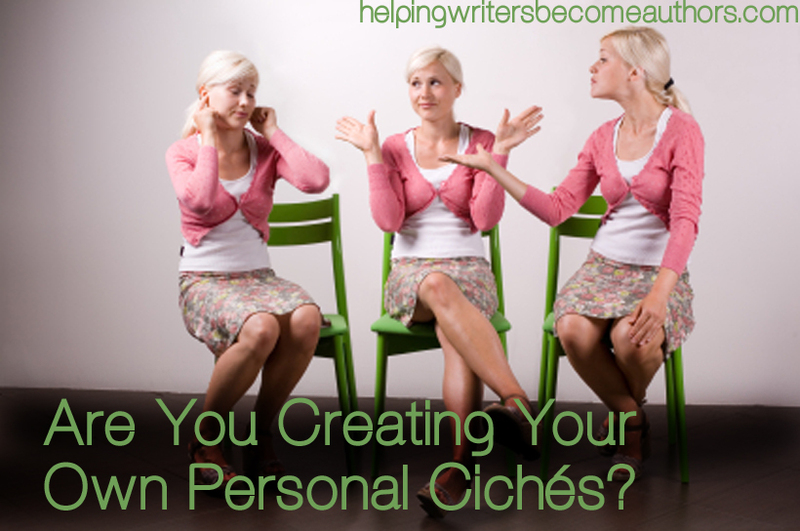 Are You Creating Your Own Personal Cliches? This week’s video discusses how authors sometimes create and perpetuate their own cliches from book to book—and how to conquer the tendency. You live with your first book all your life…. It comes out on its own. After that, though, it’s different. You can suddenly write anything. But the thing is that first book is usually the product of our deepest selves, in many ways. We’re not thinking about saving ideas for future books (which is good; pour out everything you’ve got into the book you’re writing, because who knows if you’ll get the chance to write another). No, what we’re doing in that first book is writing the characters and themes that are strongest and most meaningful in our own subconscious. But then when we start that second or third book, we’re often going to come to a moment in which we lean back in our desk chairs and realize we’re essentially writing the same story. Same character archetypes, same basic themes, maybe even the same settings and plots. We’re just dressing them up a little differently. If we look at the bottom line on this, I have to say I don’t think that’s a bad thing. I tend to think each of us only ever has one story to tell, and we just keep telling it in different ways. But that doesn’t mean we shouldn’t be aware that we’re essentially perpetuating our own personal clichés. Maybe your bad guys are always smarmy. Maybe they’re always white collar. Maybe your hero always has a beloved pet. Maybe he’s always an orphan. Things like this are ultimately less about the heart of your story and more about window dressing. The next time you sit down to write, challenge yourself by thinking back over all the characters you’ve written and making a list of the ways in which they’re similar. How can you break that mold in your next book to take a fresh look at even familiar themes? Tell me your opinion: Have you ever noticed any repeating patterns–or personal cliches–that crop up in your stories? Oh, I never thought about this. I seem fixed on pariahs. The school pariah. The town pariah. The biggest pariah in the PTO. I really need to get over that description. And check for personal cliches. Omg! Will be watching out so this doesnt happen to me!! Thank you! It happens to all of sooner or later. It’s inevitable. But it’s valuable to be on the watch for it. I know I like certain types of characters and themes so when I write different stories I use similar characters in the way that my main character tends to be lonely, and without anyone. I like to have particularly smart characters and I usually set them close to where I live or in a fantasy land. I like to write the things I connect with and understand, as I imagine most people would. I agree with what you said about us all having one story to tell but just telling it in different ways. I like making characters similar to people I know or knew and I guess people probably tell stories based on how they feel inside. That way it’s not like the story of your life but it reflects the same emotion. While I do watch for obviously repeated things I like similar feelings to be portrayed in my stories because they’re the feelings I know and the ones I love to create. Does anyone else stick to certain emotional context in their stories? If you do is it based off of emotions you feel strongly or can easily relate to? I think most authors have a “scarlet thread” running through their novel’s themes. Redemption from guilt seems to be a big one for me. It seems to crop up in all my stories, even when I don’t intend it to. I do gravitate to a particular archetype for my hero, but I try to take care with the details of who they are so each one is different. It’s amazing how much variety we can get even within the same archetype. I definitely have personal cliches. My male characters always come from difficult pasts, have little education, and have to fight hard in life; while the ladies seem to be quite comfortable until the story starts, pushing them into situations that wake them up to problems around them. It’s funny because it’s really the same thing – every. single. time. Maybe in the next story, the females will come from uneducated, rough backgrounds, while the males will be all comfy in their normal worlds? I actually hope that my body of work has a number of strong themes that run through it. I wouldn’t want my characters to repeat, but I suspect I’ll be exploring similar questions as long as I’m writing. The problem isn’t so much repeating yourself, but not taking new angles to the same questions. What does that question mean to somebody in different circumstances? Are there different answers? Consistently probing the same core themes across many works can provide insights that a single work wouldn’t. I agree. As we grow as people ourselves, in between stories, we should hopefully be finding new answers to our questions anyway. If all our answers remain the same in every story, we might want to question whether *we’re* growing, never mind our characters. I haven’t written enough books yet to be perpetuating anything other than my slow writing speed! But these are really interesting ideas. My favourite part: I tend to think each of us only ever has one story to tell, and we just keep telling it in different ways. I think I agree with this, but I also believe that one story constant changes as we move through various stages and experiences of life. Excellent point. The core story we tell at twenty may bear similarities to the story we tell at eighty, but it will have evolved in many ways. Yeaah, I tend to lean on the orphan character a lot when I’m planning a novel. On the other note I have fallen in love with making antagonists, but I’ve noticed that they tend to be the same “type” of character. But with the novel I’m planning the antagonist isn’t that “cruel” character necessarily. He’s more deprived than cruel, but any who, I’m glad you helped me to learn what I favor. Orphan characters can come in handy, not just thanks to their inherent baggage, but because they also offer a nice out for eliminating unnecessary family member characters. Think differently K.M! If composers write multiple songs, chefs prepare multiple dishes, and painters paint many paintings, then writers can certainly tell multiple stories. I want to grow as a person, mature as an artist, and be creative my whole life. If your statement were true and we really each have just one story to tell, think about what that implies for our capacity to learn and our creative spark? How depressing that would be! I think a more nuanced argument is much closer to the truth. Creativity is challenging and elusive. Ego will mislead us into thinking we’re original when we’re really recycling. Sloth also likes to recycle because personal growth takes work. My favorite trick to develop new characters is to expose myself to new people by putting myself in unfamiliar environments. Humanity is absolutely fascinating in its diversity and an endless inspiration to tell new stories. I still hold to my theory, but I’ll grant that it’s extremely general, particularly since many of us may not ever discover concrete terms to describe “our story.” We should always be striving for originality and growth. I always (if perhaps somewhat contradictorily!) encourage writers to “never write the same story twice.” But we all have specific themes that weigh on our hearts and call to our imaginations. These are often the scarlet threads that twine throughout our many stories. Perhaps a little off topic, but I am a pastor, and my preaching professor once said that a pastor writes the same sermon every week. I think this is probably true of many form of storytelling ( maybe even visual arts? ), that fundamentally we each have a point we are trying to make, and we keep refining and honing it, trying to get that point across. I would say that’s true of most pastors I’ve heard (for better or worse!). My characters are different in each story. They are living in their own world. But I agree with you many writers use the same characters and themes. For me, it is said since I can’t enjoy recycled stories. When it happens, I lose interest in stories by authors who do that. Not to mention that it’s more fun for the authors when they can keep challenging themselves to cover new ground.